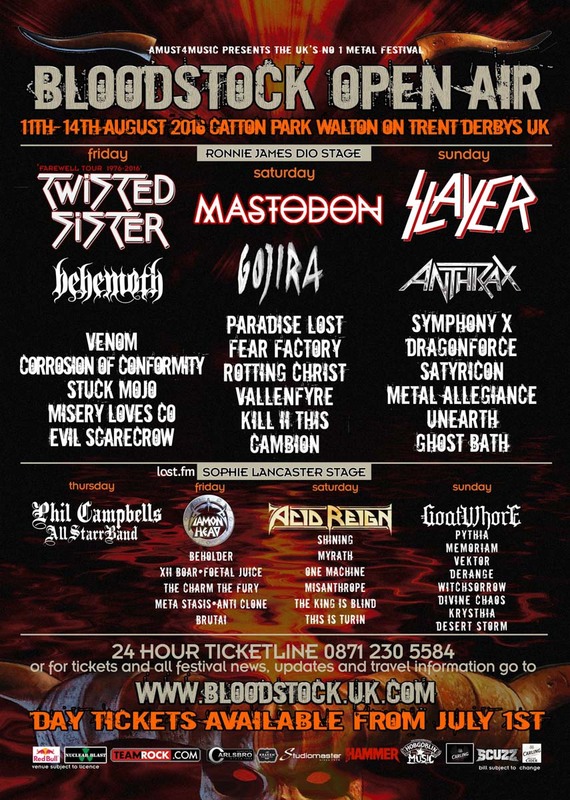 There’s just 48 days until your wait is over for BLOODSTOCK – the biggest heavy metal party weekender of the year! BLOODSTOCK HQ is a hive of activity; the sunshine is on pre-order and there are still more bands being confirmed! Joining Friday’s Sophie Stage bill are German symphonic metal outfit BEYOND THE BLACK, Wigan’s own progressive sludgelords BOSS KELOID, and self-described ‘epic fantasycore’ group FURY from Worcester. Meanwhile, snagging a Sophie Stage slot on Saturday are heavy psych merchants VODUN fresh from Stone Free festival last weekend and fast-rising London melodic metallers, THE RAVEN AGE. BLOODSTOCK is very pleased to welcome back TEENAGE CANCER TRUST as their official charity partner once again. After shattering all previous fundraising records in 2015 with a colossal total in excess of £13.5K, BLOODSTOCK hopes you’ll join them to raise even more cash in 2016 to help TEENAGE CANCER TRUST support young people with cancer all over the UK. Meantime, the ‘Metal 2 The Masses’ finals continue around the UK through to 10th July (remaining dates below). BLOODSTOCK’s ‘Metal 2 The Masses’ judging squad have been searching hard for hot new talent and these lucky bands have won slots on the Hobgoblin New Blood stage! There’s also a chance for punters at each M2TM event to win weekend tickets to BLOODSTOCK, a case of Hobgoblin Ale to take home, or various other There’s also a chance for punters at each M2TM event to win weekend tickets to BLOODSTOCK, a case of Hobgoblin Ale to take home, or various other BLOODSTOCK related prizes. You can even shake hands with BLOODSTOCK’s ‘M2TM’ mainman, Simon Hall. Remaining finals run as follows so get out, support, and win those festival tickets for yourself! Maybe you waded through D(r)ownload? Or you’re paddling off to Glastonbury? First timers and old timers, everyone’s welcome at BLOODSTOCK. If you’ve a little ‘un under 4 yrs old, they can even join you for free. No mates to go with or a bit unsure on your first visit? Make new friends with the “Bloodstock Loners & Newbies” camp, a Facebook group set up by some regulars. Learn more about VIP below, but don’t hang about, as these tickets always sell out in advance!! Keep up to date with the very latest info on BLOODSTOCK’s official sites at www.facebook.com/bloodstock and www.bloodstock.uk.com, or via Twitter on @BLOODSTOCKFEST. New bands (not only) for the Beergarden!